Rep. Tom Stevens (D-Waterbury) advocates for a paid family leave bill Tuesday. Some of the Vermont legislature’s most liberal members have a message for their colleagues: Don’t bow to Gov. Phil Scott’s vow to veto tax increases. The appeal came as the House Appropriations Committee prepares to finish its budget bill by the end of the week. As the panel pared a $73 million budget gap down to $6.4 million, complaints about budget cuts began to mount this week. The committee is building a budget based on $5 million in new revenue that would be generated by cracking down on tax-law compliance, but has otherwise avoided raising taxes or fees. That’s not sitting well with some members of the legislature. The group proposed a list of its budget priorities. Among the ideas: Raise taxes on the wealthiest Vermonters, increase the minimum wage to $15 an hour within five years, enact a 12-week paid family leave program that includes a nearly 1 percent tax on all Vermont workers, and cut or cap several programs that benefit businesses. “These are things we can do to address the needs of our budget,” said Rep. Johannah “Joey” Donovan (D-Burlington), cochair of the caucus. 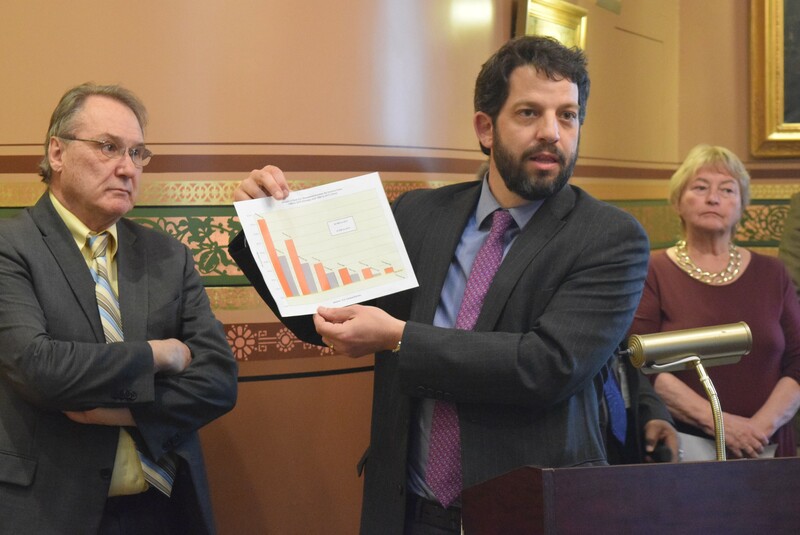 Sen. Chris Pearson (P/D-Chittenden) hauled out a graphic to show that the state’s wealthiest residents saw their incomes grow substantially from 2010 to 2015, while those with incomes from $25,000 to $75,000 had slight increases and those with incomes under $25,000 saw their incomes decrease. Pearson argued that the state should ask those higher-income residents to pay more in taxes. “These folks can handle a small surcharge on their income taxes,” he said. Sen. Chris Pearson (P/D-Chittenden) shows that income growth for the wealthiest far outpaces others. Nixing the Vermont Employment Growth Incentive, which offers grants to businesses that promise to create jobs, would save $4 million a year, according to Donovan. Another $3 million in savings could come from cutting the Department of Tourism and Marketing’s budget, she said. “They are not going to the future needs of vulnerable Vermonters,” Donovan argued of the programs the group highlighted for cuts. She questioned whether VEGI grants really create jobs that would not have otherwise been created. And she opined that local chambers of commerce could do the work of the tourism department. Those items are not necessarily on the chopping block, however. House Appropriations Committee chair Kitty Toll (D-Danville) said her committee is wary of making cuts that could end up costing the state. The committee did get some help Tuesday from Scott, who had previously declined to offer additional budget suggestions after legislators dismissed his idea to freeze local school budgets. Toll said the administration indicated the state could save about $2 million through the governor’s proposed merger of the Department of Liquor Control and the Lottery Commission. Toll said her committee is otherwise getting down to “difficult choices.” On Monday, by a bare majority of its 11 members, the committee agreed to cut $344,000 from emergency housing funds, eliminating the “cold weather exemption” that provides motel vouchers for those without housing options on winter’s coldest nights. 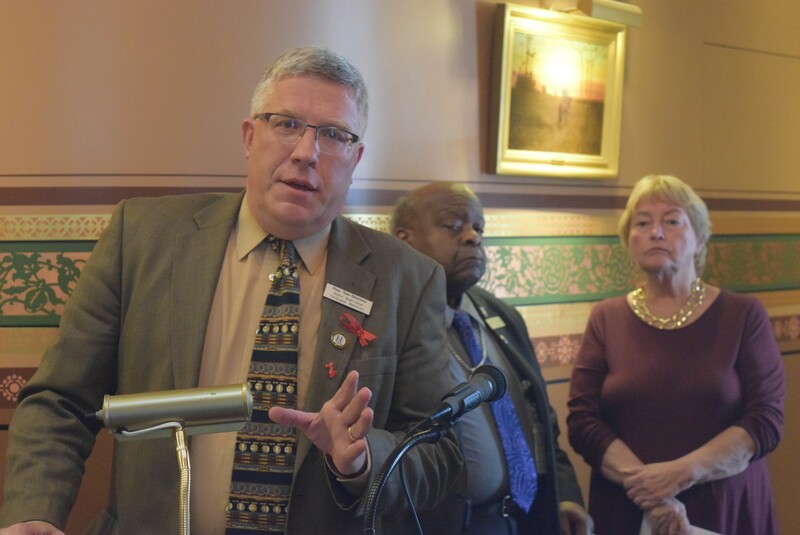 Rep. Matt Trieber (D-Rockingham), a committee member, said that there would still be $150,000 in flexible funding to help during cold-weather emergencies. “We’re trying to do cuts in areas that affect Vermonters in the least ways possible,” he said. But Erhard Mahnke, a lobbyist with the Vermont Affordable Housing Coalition, hopes to persuade the committee to restore the funding because the $150,000 pales in comparison to the annual need. “This cut is going to affect some of our most vulnerable people,” he said.